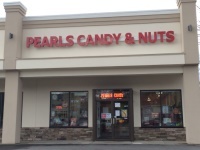 Pearls Candy and Nuts of New Hampshire has been serving sweet people in the Merrimack Valley since 1976 when Lenny Pearl opened his first store in Salem, NH. 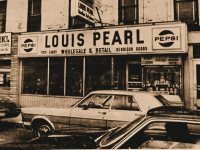 He followed his father's famous candy store on Theatre Row in Lawrence, MA. The perfect place to stop before the movies. Today we are located on Rt. 28 in tax-free Salem, NH next to Harbor Freight Tools. We offer a wide assortment of nostalgic candy and hard to find items at terrific prices. 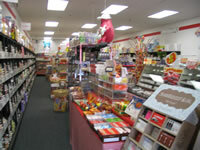 Just some of our items include: Wonka, Canada mints, red raspberry filled hard candy, Broadway rolls, licorice string laces, wax lips, candy cigarettes, Boston fruit slices, Merckens melting chocolate, Jelly Belly, sugar free candy, fresh roasted cashews and candy by the color for candy buffets. Visit us for chocolate holiday items, nut trays, hostess gifts, birthday presents and stocking stuffers. We make custom baskets, gift arrangements and Easter baskets. If you have any questions or feedback, please contact us. Please also remember that shipping to warmer areas can be a concern for chocolates or anything gooey. To assist, but with no guarantee, we suggest you order one Ice Pack for every 1-2 chocolate items you order. Our Ice Packs are reusable and last approximately 2 days when fully frozen. Please visit our shipping page for more details. * Closed on Sunday for months of June, July and August.